Mosquitoes are important pests because their biting activity interferes with outdoor activities and they can transmit disease organisms to people, domestic animals and wildlife. Most mosquitoes are active during twilight hours and at night. However, around our homes, the mosquitoes that breed in rain-filled objects, ditches, and tree holes are often active during the day. Pesticides are only a short-term solution to long-term nuisance mosquito problems. It takes a greater effort to minimize mosquito problems. 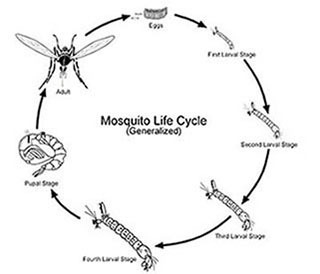 All mosquitoes need water to complete their life cycle (see diagram) and the amount of water . Some lay their eggs either individually or in “rafts” on the surface of water in swamps and floodwater areas. These eggs usually hatch within 24-48 hours depending on water temperature. Other mosquitoes (including the Asian tiger mosquito) deposit eggs on the sides of tree holes or discarded containers, or in depressions in the ground that will hold water. These eggs survive over the winter or more than a year. Some eggs hatch when they are flooded by rainfall, but several flooding and drying cycles may be needed before all of the eggs laid by a particular female mosquito hatch. The eggs hatch releasing the larvae commonly called “wrigglers” because you can often see the larvae wriggling up and down from the surface of the water. Most mosquito larvae feed on organic material as well as bacteria, algae and other microorganisms in the water. There are actually a few mosquitoes that are beneficial because their larvae prey on other aquatic insects including the larvae of other mosquito species. About 7-10 days after the eggs hatch, larvae mature transform into pupae or “tumblers” in preparation for adult life. Adult mosquitoes emerge about 3-4 days later and first on plant nectar. Male mosquitoes mate with females one to two days after the females emerge. Female mosquitoes then begin searching for an animal on which to feed. Males do not bite; they feed strictly on plant juices. 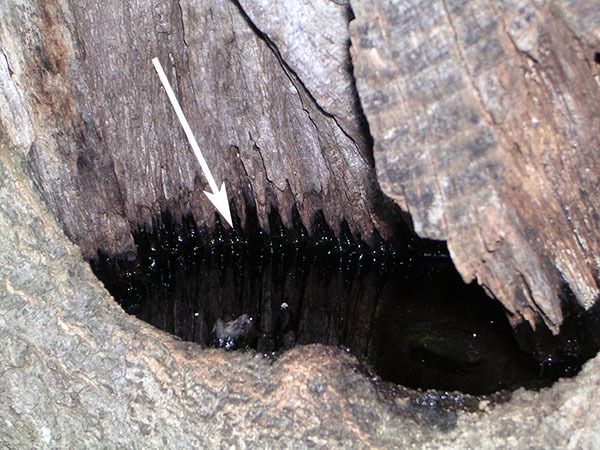 Tree holes (as shown at right) can fill with rain water and become mosquito breeding grounds. Since mosquitoes need water to complete their life cycle, the source of a mosquito problem can be just about anywhere that water can collect. Farm ponds and lakes are typically not major breeding areas for the mosquitoes that most concern us. Fish and predatory insects (such as dragonflies) in the water often keep these mosquito populations in check. We can improve this natural control by keeping the ponds free of weeds, algae and floating debris which provide hiding places for mosquito larvae. Hurricanes, tornadoes, and other severe storms contribute to problems as well. For example, tree limbs that break off can create holes in the tree trunks where water collects and allow mosquitoes to breed (image at right). 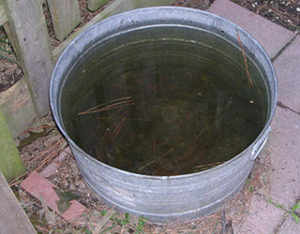 In residential areas, human activity often creates mosquito breeding sites or promote increased mosquito activity around natural bodies of water. Clogged drainage ditches along roads can become productive mosquito breeding sites. Logging and construction activities (including roadwork) often leave deep tire ruts and holes in the soil or may have silt and stormwater run-off control areas that trap water and can become breeding sites for “floodwater” mosquito species. Some mosquito species (such as saltmarsh mosquitoes) can fly several miles from their breeding site in search of blood meals. The more common Asian tiger mosquito tends to fly shorter distances (100 – 300 yards) which still allows it to invade your property from surrounding areas in your neighborhood. The mosquito’s mobility makes control on individual properties difficult. A wide-area approach that uses both chemical and non-chemical tactics is needed. “Tip and Toss” – empty or (preferably) get rid of containers, old tires, etc. that can hold stagnating water. If you use barrels/containers to collect rainwater for watering gardens, cover them with screening to keep out debris and mosquitoes. Keep the screens clear of debris as well. Dump excess water from dishes under outdoor flower pots. Flush the water out of bird baths at least twice weekly (the birds will appreciate the fresh water)..
Store boats, canoes and other objects so that they do not collect rainwater. Remove water that collects in depressions in tarpaulins covering boats and other equipment or objects. Cover or drain unused swimming pools. If you cover them with a tarp, make sure you remove leaves and other debris that collect on the surface. 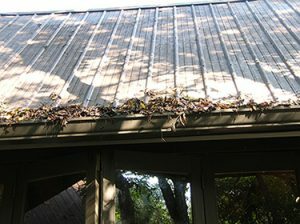 Keep your roof gutters free of leaves and other debris that prevent water from draining and will attract mosquitoes. Correct drainage problems in your yard that allow rainwater to pool in lowlying areas. Fill tree holes with expanding foam (not cement) to keep them from being used as breeding sites by mosquitoes. Remove debris (or report drainage problems) in drainage ditches and culverts along private or public roadways. Candles containing oil of citronella are often used outdoors to repel mosquitoes from around decks and picnic tables. These products work best when there is relatively little air movement that might disperse tthe chemical too quickly. Outdoor backpack or hand-held foggers will keep mosquitoes away for several hours, but once the chemical dissipates, mosquitoes may return to the area. Spraying thickets, shrubs and trees along the perimeter of your yard helps reduce the population of mosquitoes that rest in these areas, but some mosquitoes may move readily back into these areas from surrounding untreated places. Consult the NC Agricultural Chemicals Manual or your county Cooperative Extension Center for more information on selecting appropriate pesticides for use against mosquitoes. If you hire a professional applicator, ask for a copy of the product label for the pesticide(s) that they will use. Some products advertised as “natural” or “the ingredient found in chrysanthemum flowers” are actually synthetic pesticides (called “pyrethroids”) which are toxic to many other insects including beneficial ones (such as ground beetles, lady beetles, lacewings, and honey bees). These products are also highly toxic to fish. Be careful when treating near decorative fish ponds. Talk to your neighbors about when and where you plan to treat your yard. Avoid spraying when bees and other pollinators are actively foraging (visiting flowers). Spray early in the morning or later in the evening. Before applying any pesticides in your yard (or having them applied for you) be sure that you look at what is on the other side of your fence, property line, or wherever you are spraying. Are there children or pets (and their water/food bowls) in the yard? Does your neighbor have any bee hives, a fish pond, or a vegetable garden? 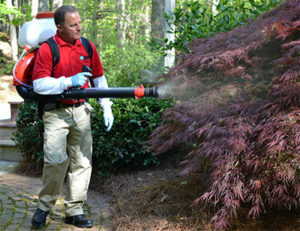 Many of the pesticides used to treat yards are not intended to be sprayed on edible plants. You can also treat mosquito larvae; however, treating large bodies of water or numerous small artificial breeding sites can be difficult and expensive, particularly for an individual property owner. Control programs targeting mosquito larvae are best left to trained individuals in county or local government agencies. Most of these chemicals are not selective and some may even harm beneficial insects and other non-target organisms. Furthermore, use of these chemicals will provide only temporary reduction in mosquito populations. Modifying or eliminating breeding sites is the long-term solution to severe mosquito problems. For small areas, such as garden pools, or water troughs for horses, you might want to try a bacterial insecticides that are available at many retail stores, garden centers and on-line garden suppliers. There are several products formulated as “donuts” (“dunks”) or as granules that contain the bacterium Bacillus thuringiensis israelensis or “Bti”. This bacterium kills mosquitoes, but does not harm fish, birds or other wildlife. The “dunk” versions are well-suited for small breeding sites (100 sq. ft. or less) and will control mosquito larvae for about 30 days. Before using Bti products, you need information on the life cycle and habitat requirements of mosquitoes in your area. Simply treating all areas of standing water without knowing if they are actually sources of the problem is a waste of time and money. Install tight-fitting screens on doors and windows to help keep mosquitoes out of your home. Although bats and birds, such as Purple Martins, consume mosquitoes as part of their diet, but they do not have a significant impact on mosquito populations. You can install nesting boxes around your property to attract these natural predators to the area. However, bear in mind that the feeding activity of insect-eating bats and birds may not be sufficiently selective to cause noticeable reductions in mosquito populations. Also, many of our major mosquito problems occur when some predators are inactive (or less active). For example, the Asian tiger mosquito is most active during the daytime when bats are normally roosting. Electrocutor traps (“bug zappers”) placed out of doors are not effective in reducing or eliminating mosquito populations. Studies have shown that less than ¼ of 1% of the insects “zapped” in such devices were actually biting insects. 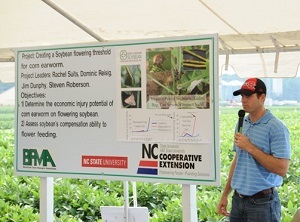 The majority of the insects killed in electrocutor traps are actually beneficial in some form. Electronic mosquito repellers that emit high frequency sound to “repel” mosquitoes have not been shown to be effective either. Claims that certain plants placed around a porch or deck will keep mosquitoes away are not supported by any scientifically-based test results. Plants or devices that emit repellent chemicals will not be effective under conditions such as high winds. Several types mosquito traps that use radiant heat and/or chemicals such as carbon dioxide or octenol to attract mosquitoes are available. Keep in miind that these traps have certain effective distance in which they attract mosquitoes and so a single trap may attract mosquitoes but not provide “control”. As with repellent plants, windy days/nights may push the chemical in directions that may reduce their ability to provide reasonable coverage.